Help Protect Yourself at Our Free Community Shred Day. On Saturday, May 12, we’ll be firing up the huge mobile shredding trucks in the main branch parking lot and we’ll be shredding all morning long! 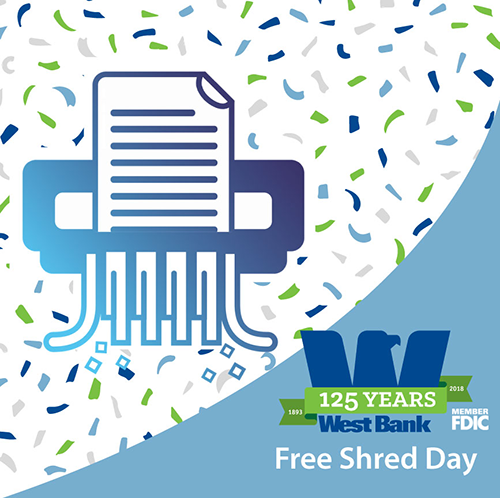 Bring your bags, boxes and bushel baskets full of documents and you’ll find a small army of your West Bank friends there to help you toss it all into the shredders. Help protect yourself from identity theft by properly destroying any documents that contain your personal information. Cancelled checks, insurance papers, old financial records, credit card offers – we’ll shred it! We'll also have our electronic record destruction and recycling company on hand to receive your old computers. They will safely and securely destroy your hard drive, helping to protect your sensitive electronic documents from theft, courtesy of West Bank. The rest of the computer will be dismantled and components will be recycled. This is for your computer processing unit only - no peripherals like monitors or printers. Peripherals may be recycled at your local waste management facility. So that we can offer this to all our customers, please limit your paper to 100lbs per person.